Adam Gasner's legal training and experience is exclusively related to criminal trial defense. Attorney Adam Gasner personally interviews all prospective clients. Adam Gasner is the only San Francisco criminal defense attorney to publicly post all dismissed cases in the last five years. Please read Adam Gasner's reviews and see what actual clients say about the representation at Gasner Criminal Law. Attorney Adam Gasner provides a no-cost initial consultation. He will explain your rights and review your options. GASNER CRIMINAL LAW is directed and managed by San Francisco native Adam G. Gasner. Mr. Gasner is board certified by the California State Bar as a specialist in criminal law – a distinction held by fewer than 400 of the more than 250,000 practicing lawyers in the State of California. If you’ve been arrested or investigated for a crime in the San Francisco Bay-Area, and you want help answering your pressing questions, contact GASNER CRIMINAL LAW for a no-cost consultation. Adam Gasner will personally meet with you in an attorney-client privileged setting, where he will review the evidence, including any citations, police reports, and documents in your possession, determine the best defense options and recommend a preferred legal strategy. In criminal investigations, time is of the essence. The earlier GASNER CRIMINAL LAW can preserve the evidence, review the crime scene, and interview any witnesses, the better for you as it lessens the chances of important information being forgotten, lost, or destroyed. The firm’s criminal law experience and knowledge of the local court system provides its clients with the best results-oriented defense against the accusations of the government. 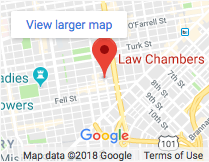 GASNER CRIMINAL LAW works closely with its team of criminal defense lawyers, investigators, and expert witnesses to provide sophisticated and aggressive representation to clients in the San Francisco Bay Area, throughout California, and in federal courts nationwide. Unfortunately, the criminal justice system does not always live up to its ideal of justice for all. Justice should be blind, but rarely is. And though the police department and the district attorney’s office have important roles and responsibilities in our society, they can still fall short, make mistakes, or get swayed by false assumptions -- the consequences of which can be disastrous for the defendant. In the worst of cases, innocent people get sent to prison for crimes they didn’t commit. GASNER CRIMINAL LAW cares about its clients and works hard for the best possible outcome. We are fully committed to defending a client with perseverance and conviction and are well regarded by the court for their brilliant legal minds and deep familiarity with legal procedures. Mr. Gasner of GASNER CRIMINAL LAW holds an AV Preeminent® rating in criminal defense from Martindale-Hubbell, meaning that Adam Gasner's peers rank him at the highest level of professional excellence for legal knowledge, communication skills, and ethical standards. He also currently serves as the president and officer of the board of the Criminal Trial Lawyers Association of Northern California. Mr. Gasner is appointed by the U.S. District Court for the Northern District of California pursuant to the Criminal Justice Act (CJA) to represent individuals charged in northern California federal courts. He is also qualified by the Bar Association of San Francisco to accept appointments in serious felony cases in San Francisco Superior Court. At GASNER CRIMINAL LAW our clients are treated with professionalism and compassion. All cases are confidential and we offer a no-cost initial consultation.